'I hope it works," ventured Michael Noonan bravely. Well, of course, he knows it will take more than hope to make it work. It'll require patience to rebuild trust, compassion and understanding for someone facing an uncertain future - and to really make a go of things, it can't be simply one-way traffic of all take and no give. But if he and Alan Kelly persevere, there's every chance that they can salvage their relationship. Without doubt it's been a rocky few months for the pair. A bit of a domestic has been rumbling on between the Departments of Finance and Environment over the thorny issue of sorting out a housing package to provide some degree of rent certainty to the legions of anxious tenants facing rent hikes. 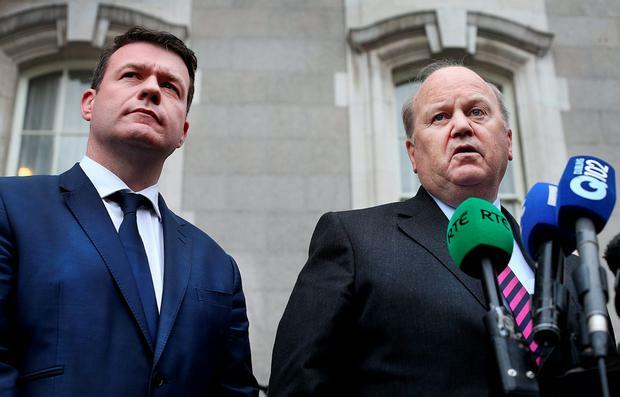 Rumours of wrangling abounded, with a wounded Alan accusing "anonymous cowards" in Fine Gael of criticising his efforts to assemble a package agreeable to both parties. The trouble was, it's not just the policies which were at odds with each other, but the personalities too. Michael is a disciple of Zen, preferring to operate in a serene and fraught-free atmosphere, whereas Alan is more of a Karate Kid, doling out chops and kicks as he sees fit. But yesterday the duelling duo made a big effort to present a united front with some high-profile PDA (Post-Discord Accord). First up, there was a decidedly self-conscious photo-opportunity with home-renter Eoin Whelan. As the cameras clicked and whirred, Michael and Alan arrived at the chap's house in Phibsborough and sat down with two big mugs of tea, smiling dutifully for the photographers. The Environment Minister merrily chatted away to the tenant, while Michael took a quiet back seat and left him at it. And it was a similar scene a short while later when the not-so-dynamic duo eventually arrived in the courtyard of Government Buildings for a joint press conference on the new package. Usually, these set-piece doorstep interviews with the Taoiseach take place bang-slap on the main steps, but yesterday everyone was squashed to the side, between a wall and a parked hatchback. (Perhaps the modest location was to prevent the ever-ambitious Alan from having notions). There was a flash of archness from Michael as the pair swerved over to the designated spot. "We'll go to the left for a change," suggested the Finance Minister with an innocent face. But it was the Environment Minister who took charge, airily dismissing the notion that he had found the protracted, eh, negotiations a gruelling affair. "It was a far from bruising experience," he assured the assembly. Alan spoke first and then invited his Cabinet companero to speak. "I hope it works," said Michael demurely. "It's vitally important that the package isn't seen as a sort of a la carte choice. The whole package needs to be put in place," he added supportively. Michael then mentioned that place which all Labour TDs fear - The Future. "I presume whoever is in government for the next five years, the supply of houses will be a constant theme". Beside him, Alan beamed fearlessly. Alan was eager to highlight his hard work in this latest triumph. There were no references to himself in the third person this time, but there was no shortage of first-person commentary instead. "I was committed to doing something in the whole rental area. I think this is rent certainty," he proclaimed. "I'm very satisfied with that." The Finance Minister seemed quite content to let his colleague bask in the limelight of this particular measure. He looked a bit weary, or perhaps he reckoned if the housing proposals should come tumbling down, that it will be Alan rather than his wily self who will get buried under the smoking rubble. After all, with an election looming, every squabble, spat and wing-ding thrown by either side of the Coalition will be the subject of intense scrutiny, particularly tantrums thrown by an increasingly edgy Labour Party, which is feeling no love from the electorate right now. All TDs on the political pitch - even the ever-bullish Alan Kelly - know they have to watch their house.